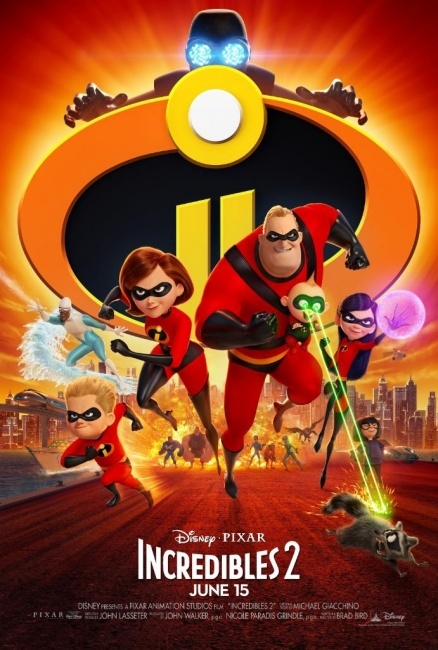 Jumpstarting a summer season that had stalled the with disappointing run of the Star Wars spin-off Solo, Brad Bird’s Incredibles 2 soared well beyond expectations to debut with $180 million, the highest total ever for animated feature (and also for a “PG” rated film of any type), driving the total box office to a 40% year-over-year increase versus the same weekend in 2017 when Pixar’s most disappointing film, Cars 3 opened with $53.7 million. The big question now for Incredibles 2 is whether it will top Finding Dory’s domestic total of $486.2 million to become the highest grossing animated feature in domestic box office history? While it will take a major hit next weekend with the debut of Jurassic World: Fallen Kingdom, the sequel to the lone non-Disney film in that list of top 10 domestic openers, Incredibles 2 is well set up for a long summer run with, a coveted “A+” CinemaScore from audiences, and no major competitors for youthful audiences until Hotel Transylvania 3 opens on July 13. Of course younger viewers aren’t the only ones attracted to Bird’s animated superhero epic, which contains action sequences that rival any yet produced for live-action spandex smackdowns. Thirty-one percent of the audience for Incredibles 2 was composed of adults unaccompanied by children. The film also earned $14 million from IMAX theaters, the favorite venue of many live-action superhero fans. 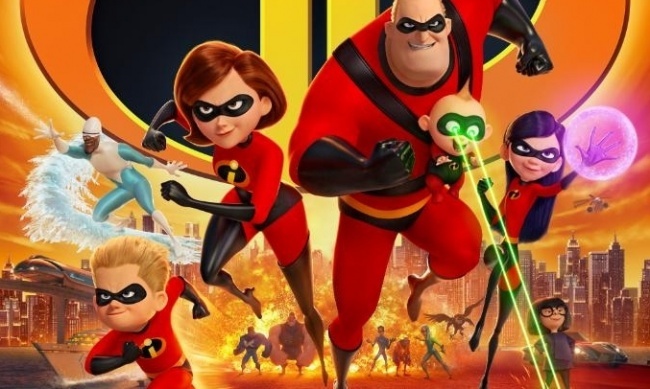 Overseas Incredibles 2 opened in about 25% of the world’s markets and earned $51.5 million, even though it was competing with the World Cup in Russia, Mexico, Australia, and Argentina. Typically Pixar films roll out slowly across the international markets, and with the World Cup this summer, the schedule is likely to be even more complicated than usual. It is too soon to tell, but Incredibles 2 appears to have the potential to set all sorts of additional records for Pixar releases. The big Incredibles 2 opening didn’t leave much oxygen in the room. Last week’s top film, Ocean’s 8 dropped 53%, adding $19.5 million to bring its ten-day domestic total to a solid $79.2 million. The $70 million dollar production has also earned $37.1 million overseas for a global total of $116 million. Debuting in third place was the R-rated comedy Tag, which earned a mediocre $14.6 million, less than its R-rated comedic brethren Blockers ($20 million) and Game Night ($17.6 million). If Tag can develop legs like Game Night, which ended with $70 million domestic, it will do all right thanks to a modest $28.7 million dollar budget, but competition will be tough over the next few weeks. Tag managed to earn an OK “B+” CinemaScore from opening weekend audiences that skewed slightly female (51%) and a bit older (with 76% over 25). Shaping up as this summer’s biggest box office disappointment Solo: A Star Wars Story earned $9.3 million to bring its domestic total to almost $195 million, as well as $5.2 million overseas to bring its foreign total to $147.1 million, and its global haul to $339.5 million. It will likely end up earning just 35% of the previous Star Wars spin-off film, Rogue One, which brought in $1.06 billion. Fox’s Deadpool 2 appears to be another Tinseltown’s successful sequels (why will the studios stop repeating themselves, if they continue to be successful with sequels like Incredibles 2, Avengers: Infinity War, and Deadpool 2). The second film featuring the “Merc with a Mouth” has now earned $295 million here in North America, and almost $700 million worldwide. The criticially-acclaimed horror film Hereditary slipped just 48.2% from its opening total, earning $7 million for a domestic total of $27.2 million. While Hereditary won’t ever match breakout horror hits like A Quiet Place or Get Out, it is already quite successful due to a budget under $10 million. Sony’s remake of the 1970s hit Superfly bombed, earning just 6.3 million from over 2,200 theaters for a lousy debut average of just $2,838—not the worst we have seen this year, but a major disappointment given the property. Nobody is going to lose big money on Superfly, which cost just $16 million to produce, and the film did earn a “B+” CinemaScore from audiences that skewed male (53%), and a bit older with 73% over 25. Marvel Studio’s Avengers: Infinity War spent its eighth weekend in theaters in eighth place as it earned $5.3 million to bring its domestic total to $664.2 million. It is now clear that Infinity War won’t catch Black Panther, which sits at $699 million, for the top spot in the domestic market in 2018, but it is now the fourth highest-earning film in domestic box office history (not adjusted)—though here is a list where the inflation adjustment does matter, as Infinity War slips all the way to #33 when higher ticket prices are taken into account. Next weekend will belong to Jurassic World: Fallen Kingdom, which, because of the World Cup, has been opening in the rest of the world for two weeks. The dino-charged sequel will debut in over 4,400 theaters here in the U.S. So far the Fallen Kingdom has opened at #1 in all 51 markets in which it has debuted, and has already earned over $370 million, which is more than Solo will earn during its entire run. In what is a typically a very conservative estimate, Universal has said that Fallen Kingdom is heading for a $130 million debut. How big will it be, and how big a drop will Incredibles 2 suffer? Check back here next weekend and find out.